The Behavioural Health Program at St. Peter’s Hospital is a specialized service for adults who have a diagnosis of dementia and exhibit challenging behaviours. These behaviours may include verbally or physically responsive behaviours in relation to exit seeking, wandering, activities of daily living and social interaction. Our teams assist adults with a diagnosis of dementia whose behaviours present risk to themselves or others, and who require a secure environment in which they can be assessed, treated and supported in their transition to an alternate level of care. Our team members use evidence-based assessments and interventions (pharmacological and non-pharmacological) to reduce intensity and frequency of behaviours, with a goal to preserve function. We work collaboratively with families and community partners to achieve a successful transition to an alternate level of care. The overall goal of the service is to maximize abilities and help achieve a successful discharge back to a community setting at an appropriate level of care. We value a biopsychosocial model of assessment and treatment involving a person-centred individualized approach to understanding the patient that emphasizes the importance of patient dignity and the role of family members in supporting the patient. We create a physical and psychosocial environment in which we promote safety while enriching, engaging, and supporting the person as a whole. We provide a supportive approach to care that includes (a) preservation of personhood and dignity, (b) knowing the person’s goals of care, (c) gentle persuasive approaches, and (d) family involvement as partners in care. We discover and use evidence-based assessments and interventions that are consistent with best practices and protocols. We collaborate to prepare patients and families for successful, timely transitions. We seek opportunities to sustain and enhance our program through strategic partnerships. We create opportunities for learning and contribute to the generation of new knowledge. 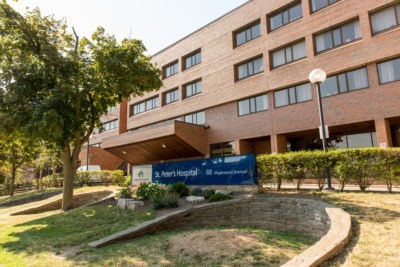 St. Peter’s Hospital is responsible for all complex care beds in Hamilton, including those based at St. Joseph’s Healthcare Hamilton (SJHH). The admitting department at SJHH provides a central intake function and maintains a shared waiting list. Joint referral will occur with St. Peter’s Hospital and the St. Joseph’s Healthcare Hamilton geriatric psychiatry program to determine which service best meets the patient’s needs. Suitability is related to frequency and severity of behavioural issues and resources required. An applicant will only be placed on one waiting list. Central Access Coordinator at (905) 388-2511 ext. 36649. All admissions occur with the goal of discharge to a lower level of care. Admission can occur from home, hospital or community service such as a long-term care (LTC) facility. Admissions from LTC are for a 60-day assessment and treatment period with return to the bed held in LTC. Consultation with LTC staff occurs to ensure continuity of care when the person returns.